Launchpad Labyrinth is the first of three secret levels in Jiggle Jungle in Wario Land: Shake It! It can be travelled to by finding a secret map in Airytale Castle. 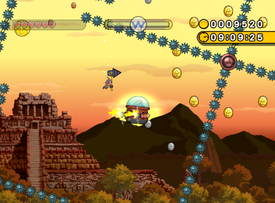 The level takes place in an ancient civilzation during sunset. The level completely focuses on Rocket Buckets and the spike rotators it activates when used. Spikes can also pose a threat. It is one of two all-escape levels in the game and has the longest time limit of 10:00. It is also one of the few levels that has the description of "They don't get any tougher" and therefore has seven missions, which are described below. Finish before the clock hits 6:00. Collect 10 small gold coins in a row. Don't break any Rocket Buckets. Mesopotapota iseki Mesopotapota Ruins, pun on "Mesopotamia Civilization". This stage was originally going to be in Ratl Ruins (hence reusing Stonecarving City's music and background). This page was last edited on December 11, 2018, at 18:20.